Can package delivery save the Postal Service? The Postal Service did better in 2013 than it has in five years, although it still lost money. The U.S. Postal Service is aggressively chasing the package delivery business. Just this week, it announced a deal to deliver packages on Sundays for Amazon (AMZN) in New York and Los Angeles for the holiday season. And in a direct challenge to rivals United Postal Service (UPS) and Fed Ex (FDX), the postal service will, for a $5 fee, start offering earlier delivery -- by 10:30 a.m. -- of its fastest "express" mail service, which ensures delivery in one or two days. The Postal Service saw 8% growth in package delivery in 2013, said Joseph Corbett, chief financial officer, posting its best year since the beginning of the recession. While the agency lost money for the fiscal year ended Sept. 30, its bottom line was buoyed by an improving U.S. economy, an increase in package delivery and a lot of junk mail. The agency said Friday that it lost $5 billion in the latest fiscal year, far less than in recent years. In 2012, it reported a $16 billion loss. The last time the Postal Service posted better numbers was in 2008, when it only lost $1.7 billion. Postmaster General Patrick Donahoe said at a meeting of the Postal Board on Friday he expects even more growth in package delivery during the upcoming holiday season. However, the Postal Service still faces massive challenges and it's seeking help from Congress. Despite a bump in junk mail volume, 2 billion fewer pieces of mail were sent in 2013 compared to 2012, thanks to a drop in first-class mail, the kind most consumers use to pay bills and send letters to Grandma. Corbett said the agency's total liabilities of $61.5 billion outstripped its $21.6 billion in assets by $40 billion. "This growth (in package delivery and junk mail) cannot make up the continuing decline of first-class mail or make up the $40 billion hole we're in," Corbett said. The agency's losses in 2013 were mostly due to the $5.6 billion it owes to the federal government to prefund health care benefits for future retirees. The agency defaulted on that payment this year, so the loss was an accounting loss. The agency is hoping Congress will ease the mandate that it make such large payments each year. The agency is considered financially independent in that it doesn't generally use taxpayer dollars, but it has exhausted a $15 billion line of credit from the U.S. Treasury because of its prefunding mandate. In an effort to cut costs, the Postal Service offered several rounds of retirement incentive packages, and more than 37,400 employees retired over the past year. The Postal Service hasn't been this lean, in terms of employees that qualify for full benefits, since the 1960s. The agency is also trying to raise revenue by increasing the price of stamps. If its regulatory panel gives the green light, mailing a letter would cost three cents more, or 49 cents, starting in January. The price of sending a postcard would also go up by a cent to 34 cents. The rate hikes are expected to raise $2 billion for the cash-strapped organization. The panel will consider the price hikes at a meeting next Tuesday. Last January, the Postal Service raised the price of a first-class mail stamp by 1 cent to 46 cents. Fredric Rolando, president of the National Association of Letter Carriers, called the results a "dramatic improvement," since the Postal Service operated with a profit, when ignoring losses like the pre-funding mandate. But Rep. Darrell Issa, the California Republican who runs a House panel overseeing postal legislation, warned the improvement would be short lived and that Congress must pass a law allowing the agency to cut Saturday mail service to the agency afloat in the future. "This is likely the last year that ongoing cost-cutting measures will generate significant savings," Issa said in a statement. 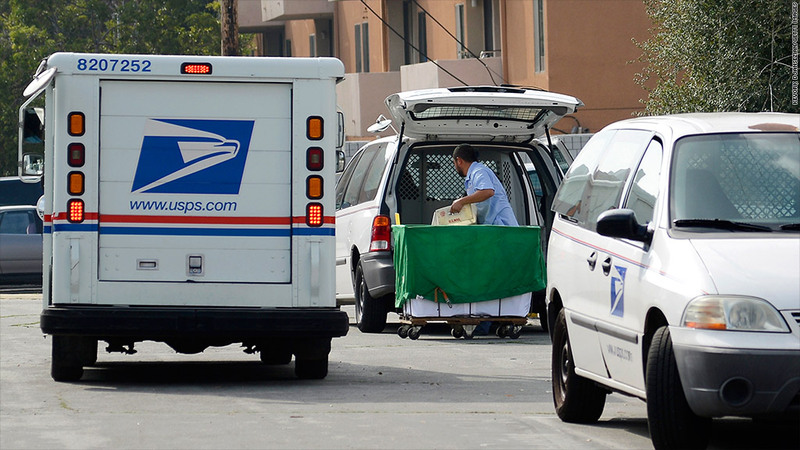 "Without legislative reform that includes modified Saturday delivery, USPS expenses will begin to increase once again."